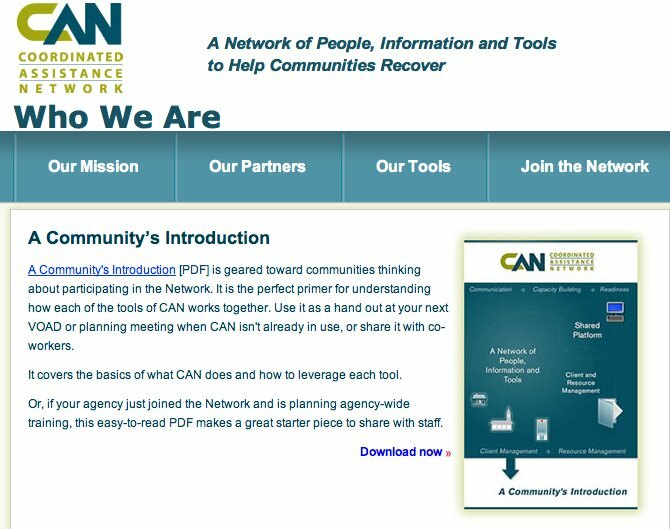 VisionLink's Lois Ann Porter and Rene Alvarez are supporting lead staff from the Coordinated Assistance Network (CAN) today and tomorrow at a regional CAN Convening being held for representatives from the LA Region. Participating organizations include the American Red Cross, UMCOR, all of the Southern California Red Cross Chapters, Salvation Army, Islamic Relief, LA County Social Services, Emergency Network LA and others. The purpose is to build on best practices and build capacity of regional organizations to provide coordinated assistance to those affected by a large scale disaster in the LA region. The work reminds us all that the professionals and volunteers ready to help during disasters are ready because of the work they do to prepare and plan--important work that is seldom seen or acknowledged. The Coordinated Assistance Network is a membership of more than 1,000 members who work together to provided coordinated assistance to disaster survisors. This kind of assistance improves client service, leverages donor resources, and mitigates fraud. 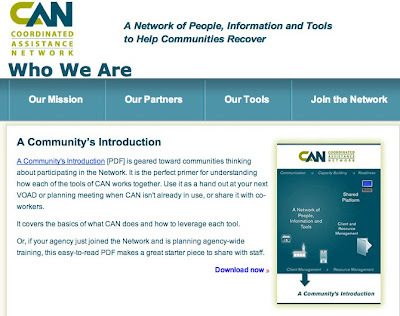 CAN's uses VisionLink's Community Operating System (CommunityOS) to deploy an always active, always ready nation-wide solution.